Are you one latte photo away from being totally stumped on what to post on Instagram next? It’s hard to continue coming up with new ideas when you’re not sure how your Instagram photos will all fit together. What goes where? What should you post first? What feels out of place? They are all good questions to ask yourself, but what do you do with the answers? Your first step to a more natural flowing Instagram feed is to focus on your aesthetic. If that feels like too fancy or confusing of a word, think of it as your visual vibe. When a first time visitor clicks on your Instagram feed, what will they see? More importantly, what do you want them to see? Choosing a color palette is the perfect place to start defining your Instagram aesthetic. Keeping your colors consistent will help you create an aesthetic that turns heads, or at least stops your follower’s scroll. Think about the last business owner you followed on Instagram. 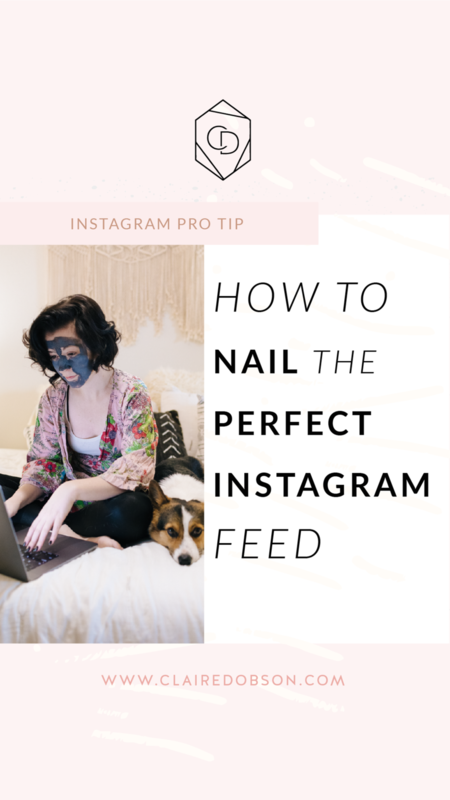 Did you find yourself having insta-jealousy because of well put together their feed was? No more of that! You can kill it on Instagram too with a few small tweaks to your color palette. Not sure what color you should choose? The answer is closer than you think! Here are a few questions to ask yourself before you decide on that bright shade of yellow or a strict black-and-white look. It’s important to choose colors you naturally gravitate toward. You don’t want to have to buy a whole new wardrobe to fit your new color scheme. Unless you want an excuse to go shopping… then by all means, go for it, girl! To save yourself a shopping trip, take a look at your current closet and see what colors pop out. Do you wear a lot of deep blues and grays, or blush pinks and neutrals? Whatever colors you find in your wardrobe should influence what color palette you choose. I have an organic yet boho chic wardrobe, meaning that I naturally gravitate toward pale pinks, plant greens, and neutrals you can pair with anything. When I prepare for a brand photoshoot, I always make sure to incorporate those colors so my look is consistent with my Instagram feed and visual branding. Then when I go shopping, I always know what colors I’m looking for! What colors do you wear on a regular basis? What colors do you frequently have around your house? It’s good to look at the colors you wear regularly, but what about the colors you surround yourself with? Surely those matter too. Take a quick look at your home decor. What colors do you see on your desk, in your kitchen, or on your dresser? Make a note of the colors you see. As I look at my own oasis (uh, I mean bedroom), I’m reminded of how much I love soft hues of pink and rich shades of browns. They’re not only found in my wardrobe but also in my home. The pink shows up in the bench at the foot of the bed and in my ultra chic throw pillows. The browns are found on my wooden bedside tables from West Elm and bohemian leather poufs on the ground. It’s clear that these colors were destined to be a part of my color palette. If you scroll through the rest of my Instagram feed, you’ll see how I’ve incorporated the same colors in my sunset, travel, and food photos. See? It’s easier than you think! Remember that cheesy 80’s song, She’s Got The Look? Well, that’s what you want your Instagram followers to say when they first land on your feed. So how do you get “the look”? It starts with choosing a filter to consistently edit your images. When you use the same filtered look, it will bring out similar colors so your photos blend together nicely. Even if you introduce a new design element to your feed, the filter will help tie it together with the other images. Take these two gorgeous Instagram grids, for example. Dana of Wonder Forest is an artist and illustrator with a light, airy, minimalistic aesthetic. While she has pops of orange, green, and red seen in the grid, she’s able to blend the photos together by not making it the sole focus of the images. You can tell each of her shots were edited with the same soft light filter to fade the brighter colors so every image fits together. However, Style Me Pretty’s feed (pictured on the right) has a romantic and natural aesthetic. You can see pops of organic greens throughout the images, but the darker greens are balanced with their signature, high contrast filter. We love how images bring out the dark and light hues, making their feed more visually interesting. Now that you have some inspiration, I’ll share some of my favorite apps and tools to help you edit your photos and find your perfect filter. A Color Story: If you want a beautiful yet DIY-friendly option for editing your photos right on your phone, A Color Story could be your answer. It’s also my personal favorite. It was created by two bloggers who have a flair for bright, vibrant colors. They have 100+ filters with over 40+ effects to help you create a consistent and unique Instagram feed. Not only that, but you can also batch edit your photos and apply more than one filter. It’s a no brainer! Cost: Free to download, additional cost for extra filter packs. VSCO: Not only is there a built-in photography community, but you’ll also have the option to combine different filters together for a unique look. VSCO is the best fit for those with a minimalist aesthetic since it doesn’t have as many features as A Color Story. Cost: Free. Play around with a few filters in these apps and see which works the best! You can even do it while you binge-watch Netflix. I definitely do that! By now, you’re probably ready (and excited) to start playing around with your Instagram feed. As you put the finishing touches on your Instagram aesthetic, take a moment to reflect on what story you’re trying to tell with your images. You’ll be most successful on Instagram if your photos not only look like they blend together (made easier with your color palette and filters) but also have a similar purpose behind them. It doesn’t matter what industry you’re in. Everyone wants to know the why behind every piece of content you produce. This is where you get to be creative. As you start to organize your photos and decide which will go side-by-side, think about the story you’re telling. And with every nine photos, you get to add a new chapter to that story. I’m excited to see what you create! Start hashtagging your images with #getfoundhq so I can follow along with your Instagram journey.